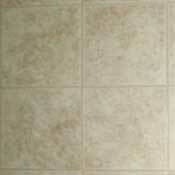 Mannington Jumpstart vinyl flooring is a durable flooring available at discount vinyl prices to fit your budget. Mannington Jumpstart contains an aluminum oxide wearlayer to provide a durable protection against foot traffic, rips, tears, gouges, and other residential stresses. Jumpstart has a Your Choice installation which allows for your vinyl to be installed with a fullspread or parameter glue. Mannington Jumpstart comes with a 10-year warranty. In Stock Price $7.92/sq.yd. = $0.88/sq.ft.